As clean and smart and modern as everything else with the Meantime branding on it, the Greenwich Union is situated on a well-pubbed sidestreet near Greenwich itself. Obviously the house beers -- kegged, bottled and casked -- are the main draw, with everything served in some of the most beautiful branded glassware I've ever seen. There's also an interesting selection of bottled imports if the many house beers are not to your liking. 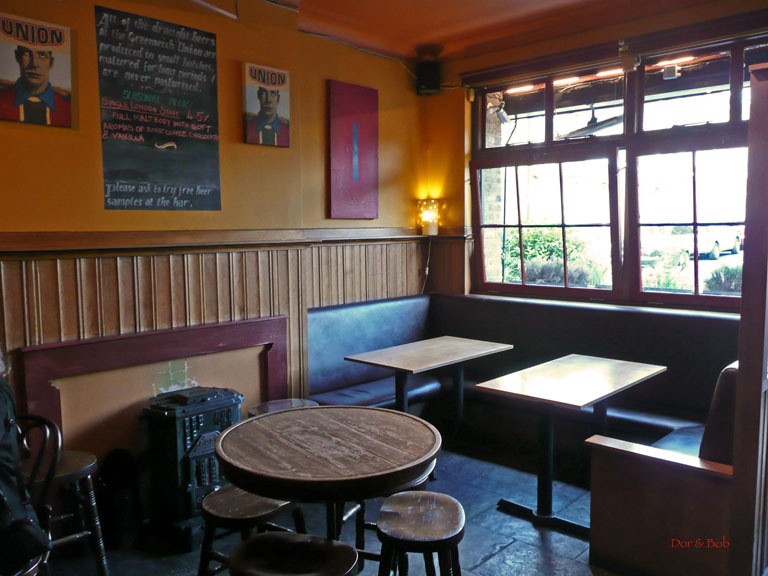 The food is upmarket pub grub, and reasonably priced, and the service is friendly. I'd say its narrowness could make it uncomfortable when crowded, but imagine it would really come into its own on sunny Sundays when the crowds are spilling out front and back. 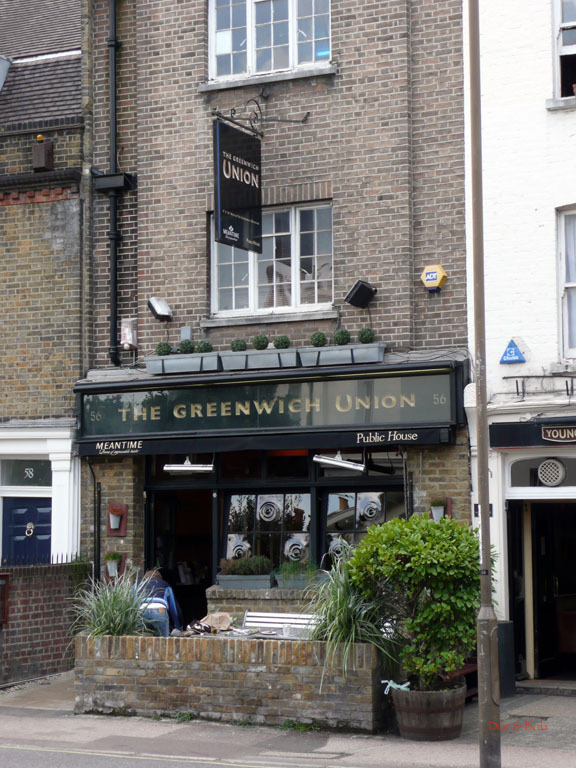 Greenwich Union is the pub for Meantime Brewery. There were no real ales from Meantime (there was one from Adnams and a cider), but there was quite a decent range of Meantime beers. 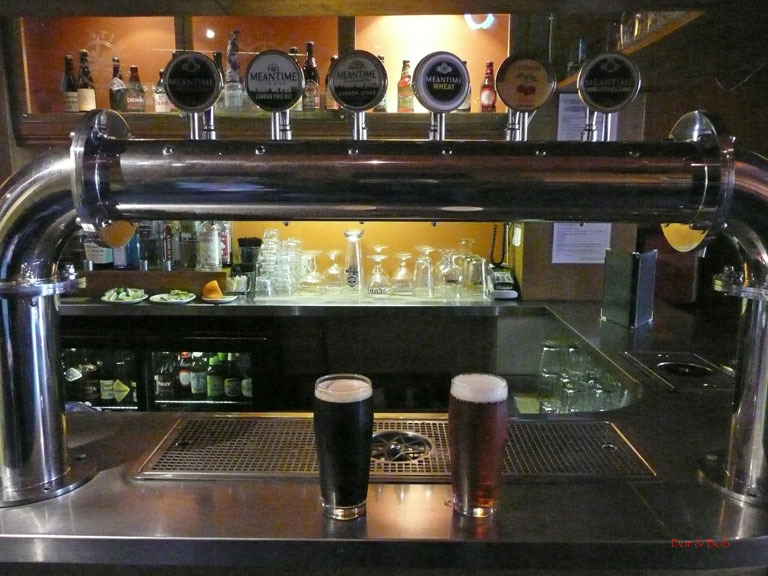 We tried the London Stout and the London Pale Ale. This is a modern pub, fairly narrow and long. Going in, you walk through a small outdoor seating area behind a low brick wall along the sidewalk, to a small front room with a few tables and bar stools, past the bar (nice light oak modern style), then to a glass ceilinged room with built-in padded benches and tables, and finally to a fairly large partially covered beer garden. The floors are flagstone and the walls are bright yellow and orange. The atmosphere was casual, present day, and local. We could easily have this as our local pub and hang out here regularly.